try kids store, toys r us. and girly stores you never know right... they have stickers. or try a teeshirt place that does patterns, they may know.. 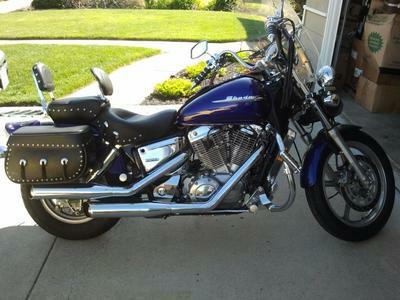 I have a 2004 VStar 650. After riding for a while and once the motor is warm/hot, I'll stop for a break; but when ready to restart the bike it will not turn over. What could be wrong with the bike? Is this a starter problem or a stador problem? hi there. first check your battery. do the lights stil go on, bright or dimming. signals work, do u see the neutral light on, if u have one. I do so i now know... etc. then if not, get volt meter see the voltage.. post to neg see if meter goer uo to 12.. or bit more. . charging system may not be working, while riding your bike... or dud battery.. this is the cheapest way to start! i know, been through 3 already..
then the stader, starter.. next, mosre expensive!!! good luck... let me know..
Hey there - I just sold my Yamaha V-Star 650 intending to buy a used BMW Adventure bike F650GS. The woman selling it however, had sellers remorse and backed out of the deal. So now, no cruiser and no other used F650GS's for sale in my area. So I have been researching and found that the V-Strom 650 seems to be a similar bike to the BMW, for less money and I could probably afford to buy it new. The 2012 model seems to be the updated model. I am 5'5 with about 8,000 miles of riding under my belt, on both a cruiser and on a Honda dual sport CRL230. Any comments or suggestions about the Suzuki would be appreciated. check out www.stromtrooper.com for the absolute best online resource for all questions V-Strom. I think you'll find that the "Wee" 650 is the better of the two V-Strom models. Big 250 lb, 6' dude here who rides thousands of miles a year on his Wee 650. One of my friends went from a 900 Blvd to a 1300 Road Star and just this year went to a VStrom 1300. She is about 5'8" and wanted something for touring. She got the VStrom used and loves it. They kept the Road Star as a spare bike as she and her husband still like riding it. Wanting to do some of easy stuff myself. Just wandering if anyone can tell how to dow it like a 5 grader. Thanks for you help. Im lucky my battery is right there, in open to see. one wrench Socket and i'm done. check the battery see if it has some life still. if so keep it for further use, if u decide to add L.E.D. lights (strips) for some bling, to your bike while riding at night..
very little power is needed, or use for emergency power outages in the house. just attach the led wires to the battery red to red etc. tape it dwon, done, u have light!! im using 2 i have as spares for my camping trip, and this way i can charge my cell, ipod, video player, gps and have light at night, instead of holding a battery in my hand, when i may need both of them!flip it over a tree. use about 15 20 feet of speaker wire.. to the orig led lights..
if anyone needs any additional info on how to do this. send a msg saying L.E.D. or battery ideas. i'll be happy to share it with you.. There should instructions in the manual for battery removal. The tips in the previous post are great. Keep all your little parts in order so you know how they go back. If you've never actually sat down and READ your owner's manual, that's a great thing to do. It sounds silly, but seriously read it cover to cover. You'll be surprised what all is in there. I have a Shadow, so my instructions are probably different from yours. If you don't have a little easy-charge pigtail on your battery for charging, during replacement is the perfect time to add one. Change it ... or charge it? Are you looking to change it (bad battery?) or charge it (just to maintain while sitting for the winter)? ... Or are you looking to pull it out and bring it in for the winter? First of all ... DO NOT BE AFRAID!!!! Turn your key off and remove it. Next ... have your tools together ... I have a little car kit I gave my son when he first started driving. It has a set of metric sockets, american sockets, 1/2" driver with 1/4" adapter, a handful of box wrenches, and a selection of screwdriver bits (flat, phillips, square and torx). There's a few other odds and ends in there too. Cheap set, nothing remarkable, but I generally have what I need. Have a good light, battery boxes are notoriously dark! Most important ... when you take things apart ... set them so you remember where they came from! The little magnetic trays are nice for that because the nuts and bolts stay put and don't roll around. You need to know which bolts had washers and which didn't and what order the washers go on in. It's so much easier to put things back together when you've taken them apart yourself! I had an '83 Shadow 500. I could just pull my left hand side cover and have access to my battery terminals, easy access. Think about installing a Battery Tender or E-Z Jump whip on your battery, then you don't need to take everything apart, just plug in the Battery Tender when you want to charge the battery. Once you disconnect the negative lead, the electrical system is effectively dead, so disconnect that first, and reconnect it last. If you need to replace your battery, my recommendation is 1st Web Sales on either E-Bay or Amazon ... I have their batteries in all my stuff. Gel cell batteries for less (including shipping) than you can buy a wet cell battery for locally. They arrive in 2 - 3 days, and stand by their product (I had one come through with a broken terminal ... they had a new one to me in two days!). Like you said, start on the easy stuff. Batteries, turn signals, oil changes ... things where fine tuning isn't critical. Then move on to things like spark plugs (be sure to check the gap!). If there's a crushable washer (antifreeze plugs and hydraulic brake lines often have these) believe it when they say "do not reuse"! Happy wrenching! I firmly believe if you ride you need to know how to do basic stuff. Most of it is just paying attention to how it comes apart. Get yourself a good manual for when you start getting into stuff you need specifications for!